University home > Services > Library > ad-lib > Never Let Go of the Book Club! Never Let Go of the Book Club! 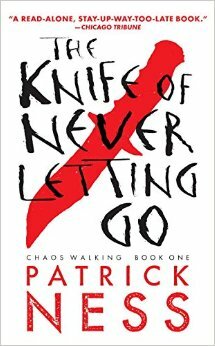 The Student Book Club meets up for the last time this term (and 2016) next Monday 5th December when the novel up for discussion will be Patrick Ness’s award winning science fiction thriller The Knife of Never Letting Go. A coming of age story with a spine-chilling twist, the novel picked up the 2008 Guardian Award and is the first part of a trilogy entitled Chaos Walking. All of our copies have been borrowed ahead of the next meeting, but you can still find it in all good book shops. The Club will be meeting at the usual time, 7pm, in the Library Staff Room. For more information about the Club, please contact Sharon Reid at the Library: S.D.Reid@lboro.ac.uk, ext. 222403, or why not join the discussion on our Facebook page? This entry was posted in Culture, Leisure Reading, Library, Literature, Student Book Club by Steven Lake. Bookmark the permalink.